Deadline to preregister if you want reduction for attend a previous edition. Deadline to propose a mini-symposium. After this date, you will pay additional 50 euros in Conference Fees. The Conference is an activity of the Jaen Approximation Project. Jaen Approximation Project has organized ten editions of the Ubeda Meeting on Approximation and nine editions of the Jaen Conference on Approximation. 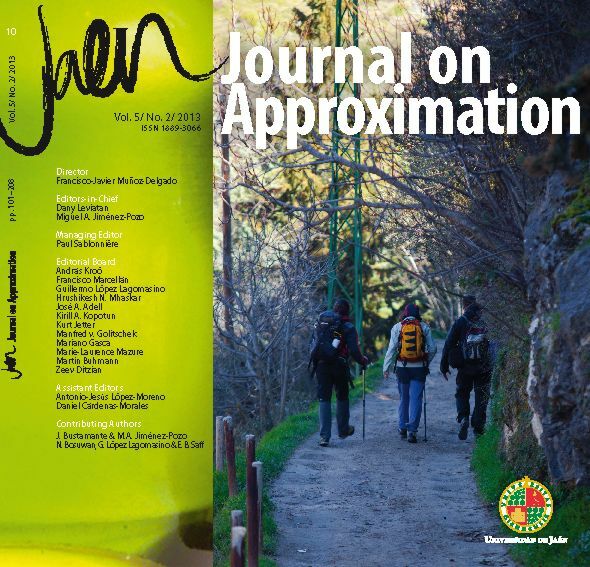 It also issues the Jaen Journal on Approximation since 2009. The objective of these conferences is to provide a useful and nice forum for researchers in the subjects to meet and discuss. In this sense, the conference programs have been designed to keep joined the group during four/five days with a program full of scientific and social activities. The Conference will be devoted to some significant aspects on Approximation Theory, Computer Aided Geometric Design, Numerical Methods and the Applications of these fields in other areas. The Conference will take place in Úbeda, a World Heritage Site. The participants are expected to arrive on June 30th, 2019 and to leave on July 5th, 2019. The opening ceremony will take place on July 1st and the closing ceremony will take place on July 4th. The Conference will feature six/eight invited speakers who will give 45 minutes plenary talks. We invite you to contribute a talk or a poster. In this edition, we also offer the possibility to attending on-line and contributing a poster. Last but not least important, the Conference provides you the possibility to visit World Heritage Sites and taste a wide culinary variety. According to previous experiences, accompanying people will enjoy the Conference. In 2019 we will celebrate the tenth anniversary of the Jaen Conference on Approximation. Did you attend any edition of the Jaen Conference on Approximation? We will happy to meet you again. Please, indicate it in our on-line registration system and obtain special treatment, including the possibility of 80% off for your accompanying people.